After five years living in California I still hadn't made it to Napa / Sonoma. Temecula and Santa Barbara are a lot closer... Napa is kinda the valley that started it all, right? Oh heck, what do I know? I just drink the stuff! So, Napa is one valley and Sonoma is another. There are sixty-seven wineries in Sonoma and probably that same number (or more in Napa). They're about a fifteen minute drive apart. September is harvest season (also known as crush). The vines are heavy with berries and it's very scenic. It's hard to know where to begin on winery row. There are loads of different maps that the wineries pay top dollar to be listed in. So instead I turned to Yelp. Through yelp I found some fun, off the beaten path wineries and learned a lot about how one website can drive a ton of business. 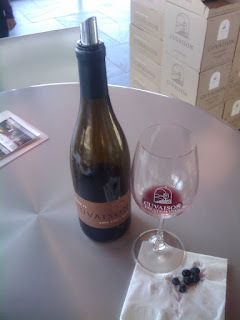 My favorite stop was Cuvaison. It's across the way from a really big, commercial winery that was not my, errr, cup of pinot. By contrast, Cuvaison is solar-powered, small and they really take the time make the tasting experience fun and informative. On this trip I learned a lot of things about wine. I also learned that there are white wines out there that I like: namely Cuvaison's Chardonnay. It also helped that our tasting person had a real passion for wine and was such a sweetheart. I asked if it was okay to taste some of the grapes so she went out and got a few. 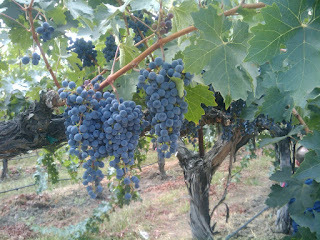 Here are the pinot noir grapes with a bottle of wine that, two or so years from now, those grapes will become! Supposedly the smaller the grape, the better. They want a small skin-to-juice ratio because the skins provide a lot of flavor. The pinot grapes tasted pretty good, actually. I'd eat 'em! So, it's crush time which means they have viniculturists and interns working like crazy to identify when the grapes are right for picking. When the sugar content is just right, it's time to pick the grapes. Sometimes they start picking at 3 am because the grapes shouldn't have another day in the sun. The grapes are then processed (see image above). This involves sorting out rocks and bugs and other foreign objects. 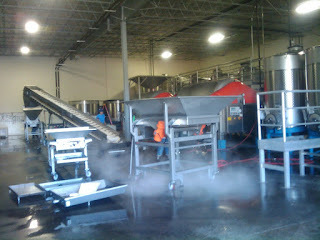 The grapes are then pressed and juice and skins go into a big steel tank. The winemaker then adds a fermenting agent. Some wineries ferment their wine in steel the whole time, some switch to oak barrels. 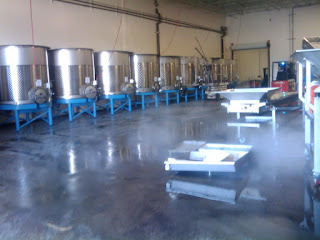 The facility we visited had up to five ton steel tanks where the grapes would sit for about a week. The expert said they could get six tons of grapes in one day, but that was above average. Six tons! There are some interesting differences between winemaking in the U.S. versus the old country. These are some comments you can drop at a cocktail party to sound like a super-smart wine snob. Typically, Europeans select wine by the vineyard - not the grape. Whereas Americas ask for a Chardonnay or a Merlot, a European would not. Instead you would ask for a Robert Mondavi or a Beringer. We also differ in the way the wine is made. In the U.S. they leave grapes on the vine longer - giving them a higher sugar content, but we don't spend as much time aging the wine. The Europeans pick sooner, but age longer. The extended aging smooths the wine and balances the brightness of picking the grapes earlier. One last factoid: one of the vintners mentioned they are discontinuing their Merlot because demand has declined. The country's taste has changed - mainly because of the movie Sideways. I asked other winemakers and they said the same thing. Lucky for this Oregon girl, I've always had an appreciation for Pinot! One Street. One Name. What's So Wrong With That?